If you dream of owning an open fireplace, one option to create the charming look you desire is with a fire basket. Available in a range of authentic and stylish finishes. Each fire basket is hand-crafted using traditional materials such as brass, steel, chrome and cast iron. And with almost 100 combinations of size & finish, there is plenty to ensure you select the perfect Fire Basket. According to the model you choose, theFire Baskets can be offered in solid fuel or gas versions. Solid Fuel Fire Baskets are suitable for logs, coal and approved smokeless fuels, so whether you want the environmentally friendly properties of wood, or live in a Smoke Control Area and require smokeless fuels, your Fire Basket can accommodate your needs. Gas versions of the Fire Baskets can be fitted with log, driftwood or coal effect fuel beds, depending on the look you wish to achieve. With a wealth of designs available, you are sure to be able to find a Fire Basket to suit your interior tastes. Capture the simple elegance of the roaring twenties with the Art Deco Fire Basket in a solid fuel or gas version. 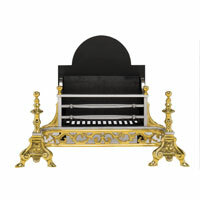 The Art Deco comes in two sizes and with two different finishes, black cast iron or cast iron with polished iron/steel. If you desire to recreate a period look, the opulent glamour of the Kendal could be perfectly suited for your home. With its brass front and ornate design, the Kendal is fit to grace any room. The exquisitely moulded brass front can be offered in a straight or bowed design. Many Fire Baskets look equally at home in a traditional or contemporary environment. The Amhurst is available in black cast iron or polished cast iron and the sleek lines of its straight front ensure it can be in-keeping with any décor. 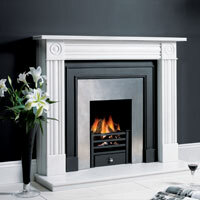 We also offers unique made to measure gas fires to fit existing Fire Baskets and open fires. These exquisite living flame fires are perfect for those who wish to create a center piece for their home or business.